Leucospermum erubescens is an eye-catching shrub that is covered with large, flaming orange pincushions throughout spring and early summer. Leucospermum erubescens is an upright shrub, 1-2 m tall, with a single main stem. Leaves are hairless, 7-9 mm long, and narrow, 1-2 mm wide, with nearly parallel sides. 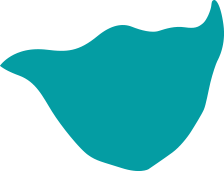 They end quite squarely, as if cut off, with 3 apical teeth, although they are occasionally rounded and can have up to 7 apical teeth. The flower heads are bright orange-red, large (50-65 mm wide), in twos or threes or in clusters of 4-8 at the tips of the branches. Each individual flower starts out yellow, when it opens the perianth tube curls back to reveal a bright crimson-red inside surface, and as the flower ages the parts that are yellow deepen and darken to orange-red. Flowering season is late winter, through spring into summer (August to January). Flower heads last on the bush for about 2 months. Leucospermum erubescens is one of the Wide-tubed Pincushions: the perianth tube widens towards the upper end. In this group it can be distinguished because the flower heads have an obvious flower stalk (peduncle) 20-30 mm long; there is a distinct junction between the stalk and the flower head; and the flower heads are slightly asymmetrical, with the styles turned towards the axis. Leucospermum erubescens is Rare, meaning that it has a naturally small population and occurs over a small area. It is endemic to the Langeberg, meaning that in nature it occurs only there, and it is a habitat specialist, which means that it occurs in a very specific combination of conditions. It is not threatened at present, but rare plants are always at risk from sudden or unexpected events that could affect the entire population. Habitat specialists are further at risk, because if their habitat is damaged or changed, they are often less able to adapt to the changes if their specialist requirements are not met. Leucospermum erubescens grows on hot, dry, north-facing slopes, rocky hills and gravel flats over a very limited range, from Muiskraal to Brandrivier in the Langeberg with an isolated population at Warmbad on the Warmwaterberg. It occurs only in North Langeberg Sandstone Fynbos. 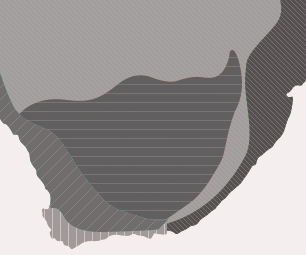 It is found as scattered populations that occur sporadically in a narrow zone, between 450 and 670 m (1500 and 2000 ft). This region experiences a low winter rainfall averaging only 250 mm a year. The genus Leucospermum is named from the Greek leukos meaning white, and sperma seed, referring to the white or light-coloured seeds of many species. The species name erubescens means becoming red, or reddening, from the Latin erubesco, I redden or blush. Leucospermum erubescens mistakenly acquired the common name 'Oudtshoorn pincushion' but as it does not occur in the Oudtshoorn area this name should be dropped. It is more correctly called the Langeberg Pincushion, although it shares this name with L. mundii. It is also known as the oranjevlamspeldekussing or orange flame pincushion. In habitat, Leucospermum erubescens is not often confused with other species - the 'other' Langeberg Pincushion, L. mundii, has much smaller, flat-topped inflorescences, its perianth does not curl back when open, and its leaves have 7-17 apical teeth. 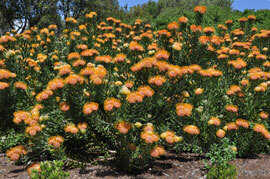 In the Garden, it is sometimes confused with Leucospermum praecox, the Mossel Bay pincushion, but the latter grows into a taller shrub, 2-3 m high, the leaves are usually larger, wider and rounder with 5-11 apical teeth, and the flower heads are more rounded and are produced singly or in clusters of up to four heads. To confirm, look closely and you will see that Leucospermum praecox flower heads have no stalk. 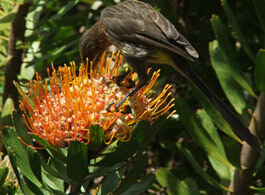 The brightly coloured, unscented flower heads are pollinated by nectar-feeding sugarbirds and sunbirds - and both are seen visiting the flower heads at Kirstenbosch. The birds perch on the flower head and probe into each flower in search of nectar, and in so doing their heads and necks come into contact with the pollen presenters and stigmas at the tips of the styles. 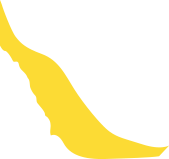 Bees and beetles are also regular visitors, but they don't come into contact with the pollen presenters and thus do not do any pollinating. The seeds fall from the flower heads when ripe, about 2 months after flowering. They have a fleshy coating on them that attracts ants, called an elaiosome. The ants carry the seeds away to their nests where they consume the elaiosome, but do not harm the seeds. In this way the seeds are dispersed and stored safely underground. This is known as myrmecochory. During a fire the plants are killed, and the following autumn the seeds in the ant nests germinate to regenerate the population. 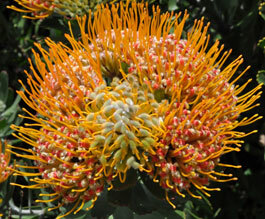 Leucospermum erubescens is an attractive, and long-lasting cutflower, and is cultivated for the cutflower market. Leucospermum erubescens needs a sunny position, in well-drained, sandy, acidic soil where it will get free air circulation. It requires moderate watering and is water-wise when established. Do not use rich manure or strong fertilisers, apply generous amounts of well-rotted compost in autumn and spring. If required, feed with low doses of regular fertiliser, or use a slow release fertiliser. 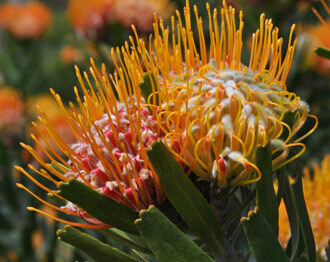 Leucospermum erubescens is a lovely garden shrub, well suited to fynbos gardens and sunny rockeries. It is also suitable for summer-rainfall, non-fynbos gardens provided the soil is acidic and well-drained, and the site is not humid. First flowers can be expected from its fourth or fifth year from seed. It is moderately frost hardy and should survive in temperatures to -4 ºC. Leucospermum erubescens can be propagated by seed or cuttings. Sow seed in late summer to autumn (March-May). Use a well-drained medium, e.g. one or two parts coarse sand, one part leaf mould and one part loam. Cover the seeds with coarse, clean sand or milled bark and keep warm and moist. Seeds need alternating cold night and warm day temperatures of 4-10 ºC and 15-20 ºC to initiate germination. Such temperatures are typical of autumn in the Western Cape and indicate the start of the rainy season. Germination can be improved if the seeds are soaked in a 1% solution of hydrogen peroxide for 24 hours. This oxygenates the seed and softens and loosens the seed coat, which should be rubbed off. Treatment with Instant Smoke Plus Seed Primer will also enhance germination. Watering the seed tray with a fungicide will prevent fungal disease. Germination takes 1-2 months and the young seedlings are ready to be potted up as soon as they have developed their first set of true leaves. Seedlings are best planted into the garden when at least one year old, and first flowers can be expected from their third year. Take semi-hardwood tip cuttings or heel cuttings from the current season's growth in late summer-autumn (March-May). Treat with rooting hormone and place in a well-drained medium and place under mist with bottom heat of 24 ºC. Good air circulation is required to prevent fungal infection. Raimondo, D., Von Staden, L., Victor, J.E., Helme, N.A., Turner, R.C., Kamundi, D.A. & Manyama, P.A. (eds) 2009. Red List of South African plants 2009. Strelitzia 25. South African National Biodiversity Institute, Pretoria. Rebelo, A. (Tony) 2001. A field guide to the proteas of southern Africa, edn 2. Fernwood Press, Cape Town. Rourke, J.P. 1972. Taxonomic studies on Leucospermum R.Br. Journal of South African Botany, Supplementary Vol. 8.